FOR COPIES of the SCORES and /or PERFORMANCE PARTS, please contact RENTALS @ OMI Music Group. Flying the Secret Skies (2008) Orchestral Soundtrack to the William VanDerKloot film. Voyage to Tomorrow (2008) for Chorus, Orchestra and Digital Media. SMOKE|WIRE|ROCK (2007) for the INGENUITY Festival of Art and Technology. Timpani Concerto #2 (2007) for Ben Ramirez. DRUMMA v2.0 (2006) for distributed percussion ensemble and interactive virtual environment. In Common: Time (2005) for distributed performance ensemble and online interactive virtual environment. Hands Across the Ocean (2004) for distributed performance ensemble and online interactive virtual environment. The Messenger (2001) for Percussion, Orchestra and Digital Media. Generations (2000) for Chorus and Orchestra. Commissioned and premiered by Atlanta Symphony Youth Orchestra. Dreamers, Then Remembering, Open the Sky (1998) for MIDI Percussion Soloists and Symphonic Band. DRUMMA (1998) for Large Percussion Ensemble and Timpani soloist. A Thousand Lifetimes (1997) A symphonic suite in three movements for 5 singers and orchestra. 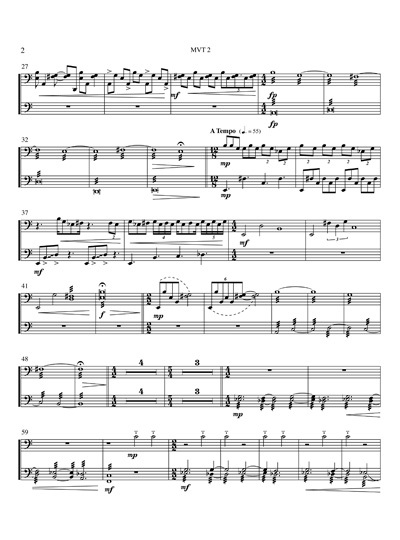 Timpani Concerto #1 (1996) adapted from the orchestral score for Symphonic Winds and Timpani Soloist. StarChild: the Opera (1996) a multimedia opera for live performers and large-scale digital media. Three Scenes for Flute and Orchestra (1995) premiered by soloist Christina Smith & Columbus Symphony Orchestra. The Science of Imagination (1995) for orchestra and large-scale digital media. Dark Serenade (1994) for Piano, Cello and Orchestra. To Boldly Go…(The Explorer) (1992) Commissioned and World Premiered as the opening for the four-year Cultural Olympiad preceding the 1996 Summer Olympic Games. Children of a Common Mother (1992) for Four Ethnic Storytellers and Multicultural Percussion Orchestra. Pilgrimage: Concerto for Brass (1992) for orchestra and brass soloists. Imaginary Worlds (1992) chamber ensemble with electronics. The Lessons of Time (1992) a large-scale choral and orchestral piece. Songs Without Words (1992) for chamber ensemble. Voyage Through the Musical Universe (1991) for orchestra and narrator. Winds of the Magic Wood (1990) for woodwind quintet and narrator. Timpani Concerto #1: The Olympian (1990) for Timpani and Orchestra, premiered by the Cleveland Orchestra. Drawn to the Light (1989) a large-scale choral and orchestral piece. Anniversary Overture (1988) for symphony orchestra. American Suite (1988) for symphony orchestra. Go Gently, My Friend (1986) for symphony orchestra. J’ai Plus de Souvenirs (1978) for Soprano and amplified Double Bass quintet. Aradia (1978) for acoustic and electronic chamber ensemble. Piano Sonata #1 (1976) for Two Pianos. Dantreume Leu Pliska (1975) for Timpani and amplified Double Bass. 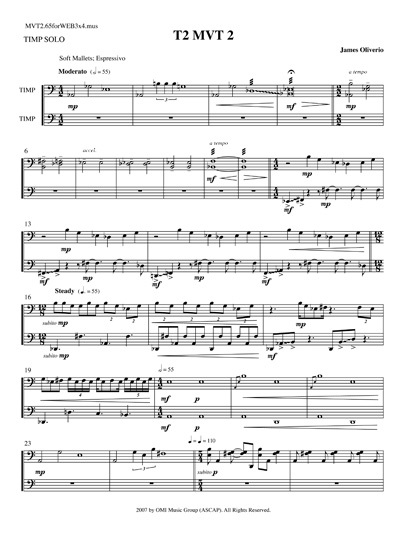 The Fall of Babylon (1974) for Mezzo Soprano and Wind Quintet.